Breed is a Democrat, as is just about everybody else in public office in San Francisco. She is considered part of the more business-friendly faction of the party. San Francisco, with a population of 870,000, is about 6 percent black — one of the smallest percentages among major U.S. cities — and those numbers are dwindling. 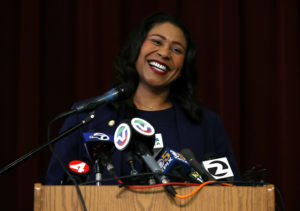 Breed is the second woman to be elected mayor of San Francisco. The other was current U.S. Sen. Dianne Feinstein. She earned a bachelor’s degree from the University of California, Davis and a master’s in public administration from the University of San Francisco.